Goldilocks wally trio is a locker that comes with 3 compartments, which are personal lockers in itself. A unique password can be kept for each compartment giving the user access only to his compartment. The locker also comes with an inbuilt vibration sensor that sounds off an alarm in case the lock is tampered with. Wall Safes are boxes that can be secured against intrusion nestled into a wall to hide them from casual discovery. Owing to its high mechanical strength, resistance to fire and thermal insulation, the offered wall mount lockers are highly demanded. Providing quality to clients being our priority, we process this Heavy Duty Locker, manufactured using quality raw materials, through a number of quality checks. 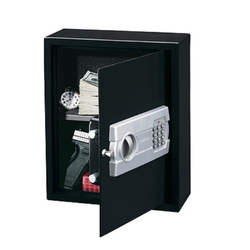 For the safety of your in house cash, data or electronic equipments (Safe logger units, master cards/keys for electronic locks etc), we recommend this safe for all the hotels. Its sleek and strong body and design provides the combination that it can be easily installed in the furniture or wall ensuring complete security to the hotel. VHK Hospitality Solutions Pvt. Ltd.